This entry was posted in Uncategorized and tagged Black powder hunting, Dennis Neely, National Muzzle Loading Rifle Association, North West trade gun, Northwest trade gun, trade gun, traditional black powder, traditional black powder hunting, traditional blackpowder, traditional blackpowder hunting, Traditional camping, Traditional Woodsman. Bookmark the permalink. In the 1950’s and ’60’s my hometown had it’s own artist. An eccentric little man who walked all over while pulling a two wheeled shopping cart that was full of his artist’s supplies. 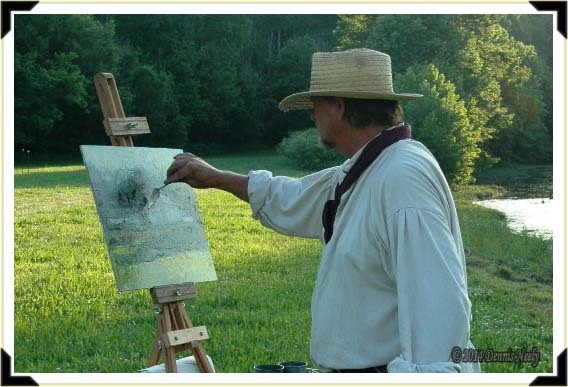 I watched him for a hour one day where he had set up his easel at the local mill dam. I was held spellbound as he used brush and trowel like magic wands to create the colorful image. Sometimes he would set up a one-man art show on some street corner of the town. In those long ago days I think he barely managed to eke out a poor living with his paintings. Today, however, now that he has passed on, his paintings are worth thousands. I wonder what became of his picture of the mill dam with the red morning sun hanging over it? I wish I had it!